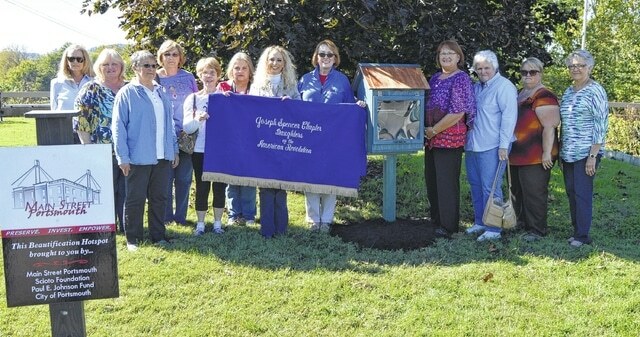 Members of the local Joseph Spencer Chapter installed a Little Free Library in Alexandria Park. The Joseph Spencer Chapter of the Daughters of the American Revolution took part in the National DAR Day of Service on October 11, 2015, to celebrate the 125th anniversary of the founding of the National Society of the Daughters of the American Revolution. The DAR, which is comprised of the descendants of the Patriots who won American independence, was founded on October 11, 1890, as a service organization to promote historic preservation, education and patriotism. There are currently nearly 180,000 members of the DAR, serving in approximately 3,000 chapters across the nation and in several foreign countries. More than 940,000 women have joined the organization since its founding 125 years ago. “Interest in membership is at all-time highs due to both the ability to share genealogical information through the internet and the fact that we offer today’s busy woman a meaningful opportunity to express her love of country and to complete the joyful responsibilities of citizenship,” said National Society DAR President General Lynn Forney Young. During the current three-year administration coinciding with the 125th anniversary celebration, the organization has issued a challenge to complete 10 million hours of service to America. While the National DAR Day of Service is one day of nationwide service, it is just an example of the work that Daughters have been completing for 125 years in communities across the nation. Prospective members are encouraged to visit www.DAR.org to learn more and to contact our local chapter at mphillips19@roadrunner.com to obtain more information about membership eligibility.